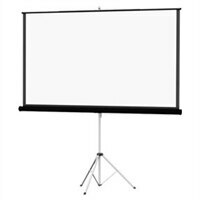 Da-Lite's wide selection of tripod and wall screens gives the presenter a professional solution for any projection application or situation. All screens incorporate Da-Lite's exclusive Camlok roller system that prevents the screen from being accidentally pulled from the roller. All screens come with black masking borders as standard. Da-Lite Picture King is a high quality professional tripod screen that is able to withstand daily usage. Heavy-duty aluminum extruded legs with toe release mechanism offer a wide stance for maximum stability. Screen height is adjustable to accommodate any ceiling height with self-locking extension tube and high-low case adjustment. Built-in fabric lock secures screen fabric during transport and use to prevent shifting.